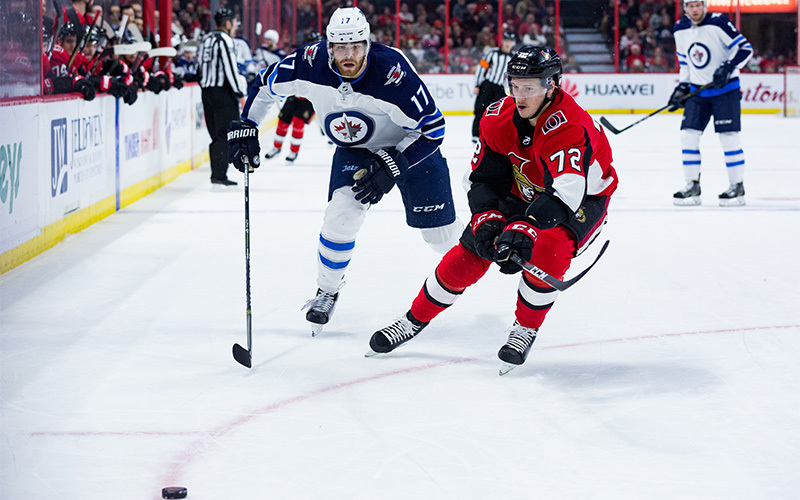 The Winnipeg Jets continue a three-game road trip in the Atlantic Division today against the Ottawa Senators…The Jets opened the trip with a 5-2 loss to the Montreal Canadiens on Thursday…Winnipeg concludes the road trip tomorrow afternoon against the Buffalo Sabres. Today and tomorrow marks the eighth of 10 back-to-back sets the Jets have this season…Winnipeg is 4-3-0 in the first game and 5-2-0 in the second game of back-to-backs this season…Last season, the Jets went 4-3-2 in the first game of nine back-to-backs and 4-4-1 in the second game. The Jets are 3-2-0 in day games this season and have outscored their opposition 20-12…Winnipeg’s power play is 38.9% (7-for-18) in afternoon games…Josh Morrissey leads the Jets in scoring in day games with eight points (3G, 5A) in five games, while Tyler Myers has six points (3G, 3A)…The Jets goaltenders have a .931 save percentage in day games. The Jets gave up a season-high 53 shots to Montreal on Thursday…It’s tied for the fourth-most shots allowed this season in the NHL and was two shots shy of matching the franchise record of 55 shots allowed in a game…Since relocation in 2011, the Jets have allowed 50 or more shots in a game just three times, including twice to Montreal. The Jets are 14-11-0 on the road this season…The Jets are 3-1-1 in their past five road games and haven’t lost three consecutive road games in regulation since Dec. 10-20/16…The Jets are two-for-five on the power play in their past two road games…Blake Wheeler leads the Jets in scoring on the road this season with 24 points (3G, 21A) in 25 games. The Jets are in a stretch of 11 games (3-2-1) in 20 days…Winnipeg went 6-3-0 in nine games in 16 days leading into the break…The Jets are in the midst of playing their last 34 games of the regular season in 69 days. The Jets are 13-7-1 against Eastern Conference teams this season, including 5-4-1 against the Atlantic Division…Winnipeg is in a stretch of seven of nine games against Eastern Conference teams…Winnipeg went 19-7-6 against the Eastern Conference last season, including a 10-3-3 record versus the Atlantic Division and 9-4-3 record against the Metropolitan Division…Blake Wheeler leads the Jets with 25 points (2G, 23A) in 20 games against the Eastern Conference, while Mark Scheifele has 24 points (13G, 11A) in 20 games. Winnipeg has scored four goals or more in 10 consecutive victories and in 16 of their past 17 wins…The Jets are averaging 4.6 goals per game in wins this season, which is the second most in the NHL…Meanwhile, the Jets have been limited to two goals or less in 10 consecutive losses and have been outscored 34-12 in those games…Thursday was the first time since Nov. 29 vs. CHI (6-5 W) that Winnipeg allowed more than four goals in a game – a span of 29 games…The Jets have held their opposition to four goals or less 49 times this season, which leads the NHL…Of the 54 games the Jets have played this season, 33 have been decided by two goals or more. Defenceman Jacob Trouba notched his 26th assist of the season on Thursday to set a career high for assists in a season…He has an assist in four consecutive games (6A) and 14 assists in 16 games since Dec. 31/18…Trouba sits tied for third in NHL scoring among defencemen since Dec. 31 with 15 points…He’s only Jets player with an active point streak. The Jets won both of their games against the Senators last season and have won four in a row against Ottawa. The Jets are 7-9-1 against the Sens since the franchise relocated to Winnipeg in 2011. The Jets have points in four consecutive trips to the nation’s capital, going 3-0-1. Winnipeg went 4-for-8 on the power play against Ottawa in two games last season to end a five-game power play drought against the Senators. The Jets are 16-for-19 (84.2%) on the penalty kill in their last five games against the Senators. Blake Wheeler leads the Jets in career scoring against the Senators with 21 points (11G, 10A) in 33 games. Patrik Laine has four points (1G, 3A) in four games against Ottawa. Mathieu Perreault has three game-winning goals and a 24.2% shooting percentage in 18 games against Ottawa. Goaltender Connor Hellebuyck is a perfect 4-0 with a 2.25 goals-against average and .927 save percentage in four career starts against the Senators. Senator Mark Stone calls Winnipeg his hometown. Jets forward Mark Scheifele was teammates with Stone at the 2012 World Junior Championship. Defenceman Dustin Byfuglien and goaltender Craig Anderson were together on the Chicago Blackhawks roster during the 2005-06 season. Kyle Connor (17th overall) and Sens defenceman Thomas Chabot (18th overall) were drafted in consecutive spots in the 2015 NHL Entry Draft.